This time of year is always hard for me. In Israel, we move quickly from Passover to Holocaust Memorial Day; a week later, we mark the Memorial Day for Fallen Soldiers and Victims of Terror; a day later we celebrate Independence Day. We go from attending solemn ceremonies as the sirens blare to attending joyful barbecues as the military parades pass. These set rituals are meant to give meaning to us as a society, framing Israel’s official narrative: from slavery to freedom, from victimhood to victory. I still believe that there is deep historical and mythic truth to this narrative. But like all official narratives, it’s incomplete. It teaches us to see the Jewish people, and Israel as the expression of the people, as the world’s ultimate victim, doomed to live by the sword. Then what? More war until the Messiah comes? Army and death forever? When my children were born, I, like every other Israeli parent, hoped they wouldn’t have to serve in the army. Now, they’ve already completed their army service, and I’m starting to wonder about my not-even-born-yet grandchildren.
. . . First there are the official ceremonies, filled with real and forced pathos, where political officials buck up the national narrative. . . . Pay homage to heroes who died in wars, the politicos demand, as they shirk their responsibility for making peace. . . . They encourage us to support the army, because it protects our borders, and they hope we don’t think too much about protecting democracy, justice or equality. They caution me not to recognize a Palestinian mother’s pain, because that is a denial of a Jewish mother’s pain. . . .
Then there are the “alternative” ceremonies, conducted by various far-left groups. . . . Turn your back on the flag and denounce Jewish nationalism, they insist, while they assert the right of the Palestinians to the same nationhood. . . . Deny that you are afraid for your children and yourself, because Palestinian violence is merely a result of the occupation. Denounce the army, because there is no need to protect our borders or ourselves. Do not give credence to Jewish pain, because then you are denying Palestinian pain. Unlove your country, because there is nothing good here anymore. So this year, for the first time, I decided to attend the Israeli-Palestinian Memorial Ceremony. Sponsored by the Combatants for Peace Movement in cooperation with the Parents’ Circle – Bereaved Families Forum, the ceremony was established by a bereaved parent, Buma Inbar, whose son, Yotam, a fighter in the Golani Brigade, was killed in Lebanon in 1995. 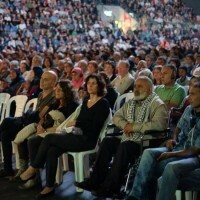 I sat with some 3,000 Israelis, plus hundreds of Palestinians from the West Bank (who received special permits from the Israeli security authorities to attend the ceremony). I listened to Neta Shemesh, a mother of three and grandmother of two, who lost her mother when terrorists infiltrated her kibbutz in 1974, and lost her brother in the first Lebanon War. I heard the words of Adan al-Masri, a mother of eight from Nablus, whose son Wassam was shot in the head during violent demonstrations at Joseph’s Tomb in September 1996. I watched as Yigal Elhannan, who lost his sister Smadar in a terrorist attack in downtown Jerusalem in September 1997, embraced Arab Aramin, whose sister Abir died from a rubber bullet fired by a border patrol officer while she was walking home from school. There was music and dance, and a search for new art forms for complex expression. As the organizers promised, the ceremony demonstrated, however briefly, the possibility of peace not based on indifference to pain, but rather with a direct reference to loss and bereavement on both sides. “The only revenge for the death of Abir and Smadar is peace,” Arab and Yigal said. This ceremony has been held for 11 years, and each year more people participate. But I have always steered clear of it. . . .
. . . by taking the risk and attending this ceremony at last, I made a commitment: to remember and to hope, to feel the pain and to look to the future, to celebrate Independence Day while recalling the Nakba and trying to build a better society. To mourn the dead, but never to value them more than the living. To read this in its entirety, click here.